Description: Aaron Edward Eckhart is an American film and stage actor. Born in California, he moved to England at 13 when his father relocated the family. Several years later, he began his acting career performing in school plays. In 1994, he graduated from Brigham Young University with a Bachelor of Fine Arts degree in film. For much of the mid-1990s, he lived in New York City as a struggling, unemployed actor. In 2000, Eckhart gained wide recognition as George in Steven Soderbergh's critically acclaimed film Erin Brockovich. In 2006, he received a Golden Globe nomination for Best Actor for his portrayal of Nick Naylor in Thank You for Smoking. 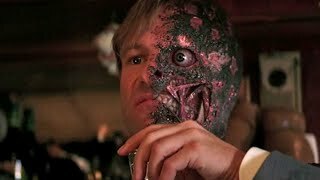 In 2008, he starred in the big-budget studio film The Dark Knight as District Attorney Harvey Dent and the villain he becomes, Two-Face. Eckhart was born in Cupertino, California, and is the youngest of three sons born to Mary Eckhart, a poet and children's author, and James C. Eckhart "Jim Senior", a computer executive. His brothers are James Lawrence Eckhart (born 1963) and Adam Eckhart (born 1966). Eckhart was raised as a Mormon in The Church of Jesus Christ of Latter-day Saints. Eckhart was engaged to actress Emily Cline, whom he met during filming of In the Company of Men, but separated from her in 1998. From 2006 to 2007, he was in a relationship with SheDaisy's Kristyn Osborn. In 2007, he dated Ashley Wicks, though the two have ended their relationship. He has been reluctant in speaking about his relationships in interviews. In 2009, Eckhart dated actress Molly Sims.